Escape an Antlion cave filling with water, use platforming to reach new heights, and knock Antlions out of your way with the Gravity Gun. Gordon Rising is a single player level built for Half-Life 2: Episode 2 ﻿u﻿sing only displacements for geometry. Gordon is trapped at the bottom of an Antlion cave that is filling with water! Alyx is standing overwatch at the mouth of the cave, providing cover or advice when necessary. 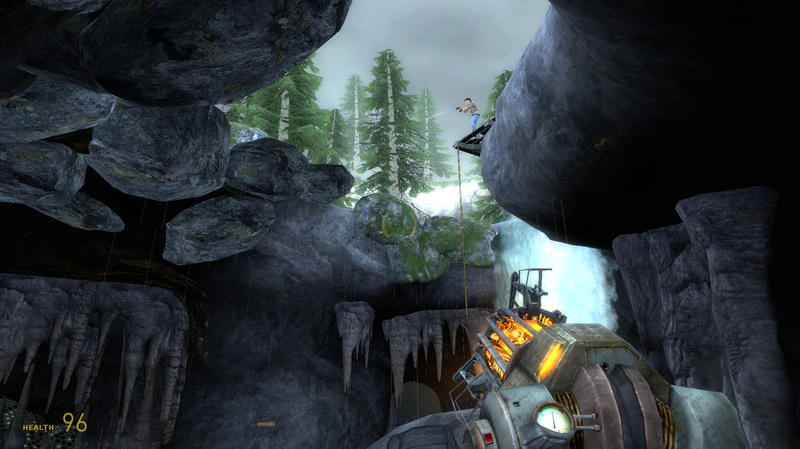 Gordon must climb his way to the top of the cave while avoiding Antlions and the leech-infested water that is slowly rising up. 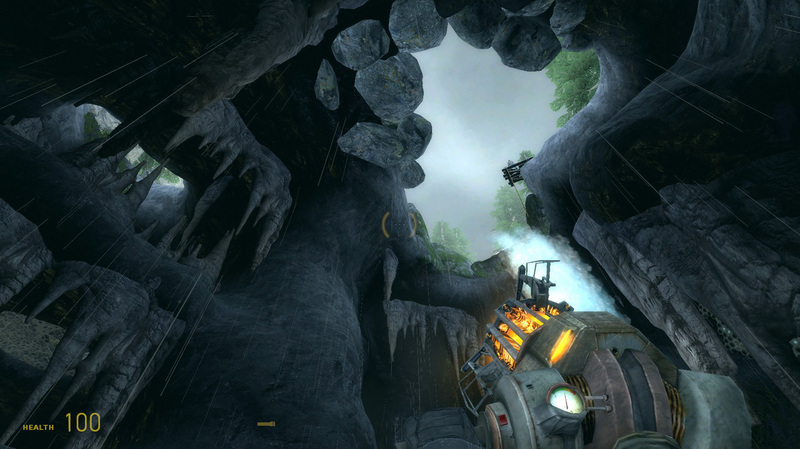 For Gordon Rising, I wanted to make a level where there was something that was always pushing the player forward. 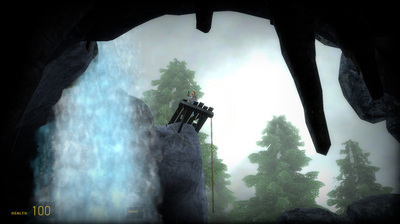 The rising water mechanic fulfilled this role perfectly because players immediately knew they needed to gain elevation to avoid it, which complimented the platforming gameplay very well. With the platforming I wanted to try and make it as least frustrating as possible, so there were many indications on where to go and falls were very forgiving at times. Antlion grubs and Antlion webs helped guide the player and let them know they were on the right track. Hints from Alyx also appeared if players got stuck in some of the more difficult areas for too long. 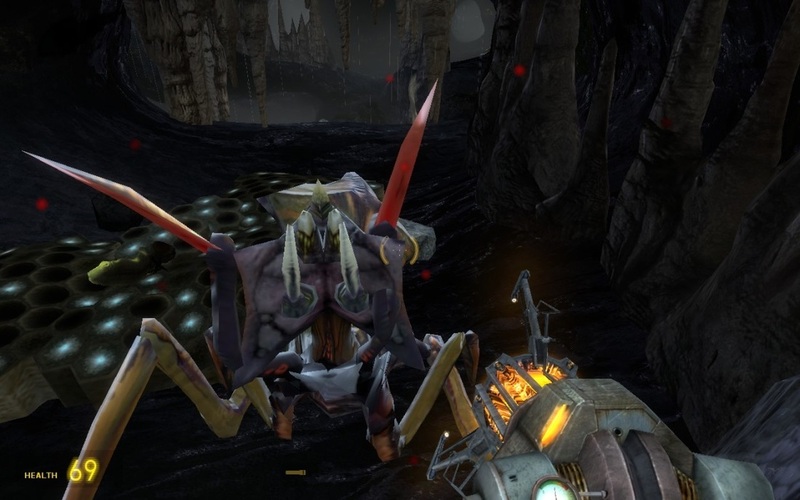 The gravity gun and Antlions fit naturally well within the environment as the ability to punt Antlions into the water and kill them instantly was not only easy, but very fun as well. 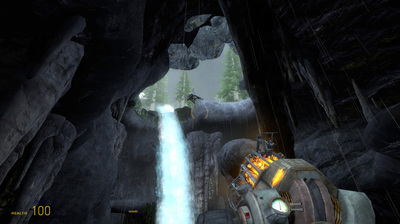 The addition of Alyx standing overwatch at the top of the cave also helped guide players and let them feel like they were not alone in this challenge as she helped kill any Antlions that walked into her vision. Displacements - I wanted to challenge myself and improve my displacement work. So I went with a cave environment and made it fully out of displacements. The creation of the base cave itself did not take too long as I was able to figure out a quick method of setting it up. When subdividing the displacements though (automatically curving the displacements to each other), it took 30 minutes to complete. Then it became a process of going through and manually changing areas to look more natural. In the end the cave came out looking well and didn't take nearly as long as I expected. Combat and Gameplay - The level turned out really well in terms of fun. People enjoyed playing this short little level. Punting the Antlions around was fun and the platforming wasn't so difficult that people were constantly frustrated. Lighting - The lighting for the level was a constant problem. The large gaping hole of the cave provided a lot of light for the center but the outer areas that were deeper in the cave were not so lucky. I used Antlion grubs and nests to try and provide lighting but I didn't make it bright enough. Another issue was the stalactites/stalagmites. I could just not get them to light correctly in the environment, even with the use of info_lighting. Rising Water Balance - The Rising Water either came out as not dangerous at all or too dangerous. For a long time it only did 1 damage a second to players that fell in. This let people find a ledge to climb back on and was more forgiving for less skilled players. More advanced players however, never felt in danger. I tried starting players off at half health to try and making it more dangerous but the gameplay provided such a skill gap that it only hurt the less skilled players. I recently updated the level now so where players start at full health, but the water does full leach damage now (which kills in ~4 seconds of prolonged exposure). The damage only activates after players have been in the water for 4 seconds though and I added in more autosaves. This will hopefully make it more dangerous for higher skilled players if they fall, but also be more forgiving at times for less skilled ones. Displacement Creation - Of course I learned a lot about how to make natural looking environments in Hammer using displacements. I think that constantly challenging yourself by doing things that you aren't good at or want to improve on is the best way to get better. 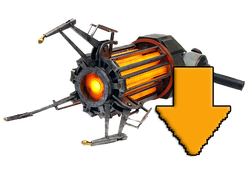 How To Guide the Player - Light is one of the best ways to guide the player and it is used throughout the level. There are holes in the cave that let natural light in as well as grubs and Antlion nests that provide light in darker spaces. Gameplay also helps guide that player as Antlions grubs attracted players to go over to them and step on them, and Antlion webs told players they had to go and get through this area.